The DLP® LightCrafter™ 6500 is a high performance, yet flexible evaluation module for incorporating DLP technology into a wide variety light steering applications. This EVM is an easy path for those developing solutions requiring high resolution, optical throughput and brightness at a competitive price point. The DLP6500 offers true HD resolution, 1920 x 1080, or over 2 million programmable micromirrors. The DLPC900 enables impressive pattern rates up to 9,523Hz. These high rates enable real time 3D machine vision measurements, faster 3D printing builds, and more accurate digital light exposures with competitive cycle times in industrial markets. DLPC900 also offers designers maximum flexibility to format and sequence light patterns, which can easily be controlled via the graphical user interface. The DLP LightCrafter 6500 allows for a configurable input/output trigger for convenient synchronization with cameras, sensors, or other peripheral devices. The added flexibility enables diverse architectures for industrial, medical, security, telecom, and instrumentation applications. 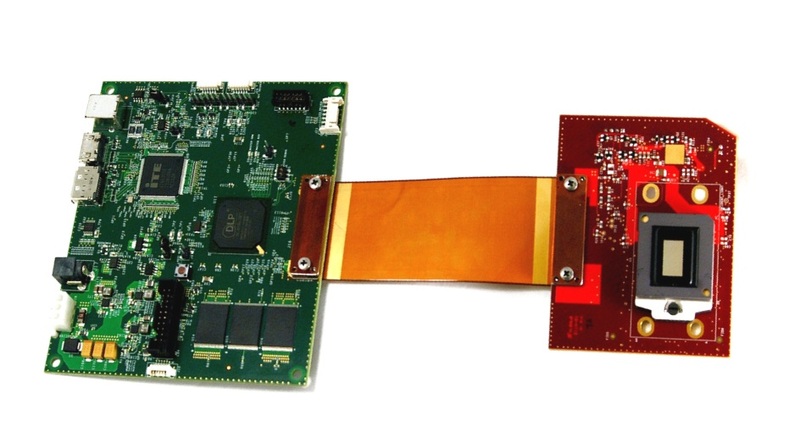 Texas Instruments provides free software and firmware downloads to give developers flexibility and advanced control of the DLP LightCrafter 6500. In addition, the reference design documentation allows customers to develop custom products based on the DLP6500 chipset included in the LightCrafter 6500. DLP LightCrafter 6500 Firmware and Software Bundle: This bundle contains the following components. DLPC900REF-GUI: The software bundle includes the executable files for the PC-based Graphical User Interface (GUI) for easy communication over USB with the DLPC900 controller. The GUI was developed using the QT Library and the QT Creator. DLPC900REF-JTAG: The JTAG Flash Programmer gives developers the ability to load the DLPR900 configuration firmware into flash memory attached to a DLPC900 controller. JTAG boundary scan programming allows developers to install the DLPR900 firmware in the absence of standard USB connectivity. DLP6500-C900REF-EDID: The EDID configuration script updates the DisplayPort EDID on the DLP LightCrafter 6500. DLP LightCrafter 6500 EVM Reference Design: The reference design includes schematics, Gerber layout files, and bill of materials for the DLP LightCrafter 6500.